Panzer-Divisions in Battle Book 1939-45 Discounts Apply ! 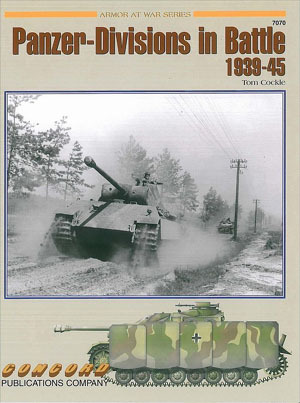 CON7070 - Panzer-Divisions in Battle Book 1939-45. "Blitzkrieg"' or Lightning War, was a new concept that Germany unleashed on a series of countries beginning with Poland on 1 September 1939. The new book, Panzer-Divisions in Battle 1939-45, examines the role panzers played in WWII through a series of photographs and illustrations. Authored by Tom Cockle, the volume begins with a pr�cis of the various battles and theaters in which German tanks saw combat. This first volume on the topic provides coverage of the Invasion of Poland, the Battle for France, the Intervention in the Balkans, and ends with the Desert War in North Africa. The main focus of the book is the extensive selection of black and white photographs. These show not only tanks like the ubiquitous series of Panzer I, II, III and IVs that formed the nucleus of the all-conquering panzer divisions, but also associated equipment such as the Czech-built Pz.Kpfw.38(t) tank, a variety of armored cars, plus the well-known Sd.Kfz.251 halftrack. Unarmored vehicles such as the whole range of halftracks are not left out, alongside other equipment like antiaircraft guns and howitzers. The photos showing vehicles in a range of theaters will prove inspirational to modelers contemplating their next project. The authoritative writer offers detailed and useful captions for each photo as he highlights pertinent aspects of the vehicles. The centerpiece of the book is a collection of 16 color plates by Laurent Lecocq, which offers the artist�s interpretation of how vehicles appeared in reality. This stimulating book will be an asset to any library on German military vehicles, and it sets the stage for the next volume to continue with the Invasion of the Soviet Union. Features: 72 Pages, 169 b/w Photos and 16 Color plates.